Conventional marshmallows contain gelatin, an animal product which many individuals stay away from for health, ethical and/or religious reasons. Here’s the vegan version using agar-agar. Mix agar-agar into 1/2 cup of cold water. Bring sugar and 3/4 cup water to a boil in a saucepan. Do not stir once syrup begins to boil. Heat to 238 degrees F (114 degrees C) or until a small amount of syrup dropped into cold water forms a soft ball that flattens when removed from water and placed on a flat surface. Remove from heat and add the agar-agar. Pour syrup into a glass bowl; let cool briefly. Beat the syrup using an electric mixer until thick and white. Mix in vanilla extract and salt until the marshmallow mixture is combined. Mix 2 tablespoons stevia powdered sugar and cornstarch together; spread over the bottom of a 9-inch baking pan. Pour the marshmallow mixture on top; let stand until firm, at least 1 hour. 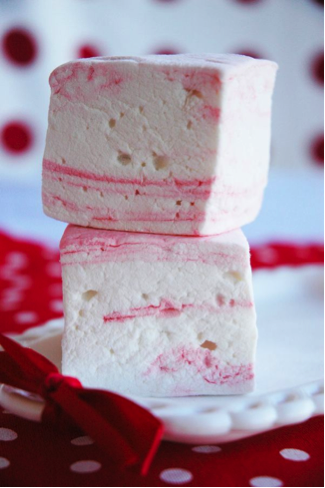 Cut into square marshmallows using a wet knife. Dust with remaining stevia powdered sugar.